The day I followed Highway 299’s winding curves into the tiny town of Willow Creek, the leaves on the maples, oaks, dogwoods and buckeyes along the route had turned a deep yellow and crimson — colors that matched the late fall foliage on David Winnett’s grape vines. Willow Creek, Calif., is one of the country’s smallest American Viticulture Areas (AVAs), comprising about 6,000 total acres and home to just three wineries: Dogwood Estate Winery, Sentinel Winery and Winnett Vineyards. The actual Willow Creek AVA straddles both Humboldt and Trinity counties and is located about 45 miles east of the coastline, tucked into the northernmost corner of the state. David Winnett was in the process of flushing out some of his French oak wine barrels when I arrived on that cool autumn morning. He smiled about the formation of the Willow Creek AVA and said the relatively light history of viticulture in the area was one of the draws for him and his wife, Sharon, when they bought their property and began planting vines there in 2000. The Winnetts, retired educators by then, were looking for new adventures after selling their Illinois farm and moving west. They had considered property farther south in Sebastopol, but something about Humboldt County, and Willow Creek in particular, appealed to them. According to Winnett, Willow Creek’s wine background is, at best, sketchy. Winnett talked about an Italian family who raised fruit in the area during the early 1900s. He speculates they may have bootlegged a bit during Prohibition and made their own wine to sell at a roadhouse café, “probably heavy, red, rustic stuff.” He also spoke of a wealthy rancher who owned a private airplane and turned part of a 60-acre parcel into vineyards to sell grapes to home winemakers in the 1970s. But, he said, it was Ed Olivera, a Humboldt County school superintendent, and his friend Dean Williams who really changed things. The two began making wine from Willow Creek grapes in the early 1980s. Pleased with their success and determined to make a name for the fruit grown in this remote California region, they bonded their wineries and applied for a viticulture designation, which they received in 1983. 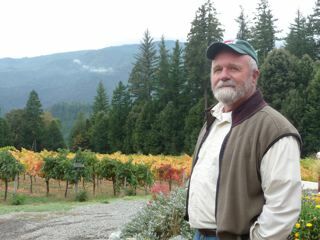 Regardless of the size of the AVA, its history of grape growing and producing or how the designation came to be, Winnett is well pleased with the 10 acres of grapes he’s been able to cultivate over the last decade and happy that he and Sharon chose Willow Creek as the home for their viticulture enterprise. Winnett’s educational background is in science. He said he made some basic assumptions about the Willow Creek AVA, then got busy with research on the historical data of the climate and soils indigenous to the area. Using a diagnostic tool from the University of California at San Diego that allowed him to access 25 years of area statistics, Winnett said he discovered that, “lo and behold, there are as many heat days in Willow Creek as there are in Bordeaux and Napa.” In other words, this country was ultimately capable of producing good grapes. Winnett Vineyards’ current plantings include Cabernet Sauvignon, Merlot, Malbec, Chardonnay, Sauvignon Blanc, Riesling, some Viognier and a relatively new crop of Sangiovese, which will figure big in a proprietary blend they plan to release this coming spring. Harvest from the vineyards yields between 800 and 1,000 cases of wine per year for the Winnetts. Although there are approximately 26 boutique-sized wineries spread throughout the greater Humboldt County area, relatively few of the winemakers associated with them grow their own fruit. Most source grapes from other parts of California and then transport the fruit or juice up to the region to create their wines. Some do a combination of local viticulture and then fill in with grapes sourced elsewhere. Winnett is among those who farm. All of the wine produced and sold through the winery comes directly from the organic fruit grown on the property. For Winnett, the whole estate winemaking process is key to what grounded him here originally. For more information or to contact the winery, go to Winnett Vineyards or call David and Sharon Winnett at (503) 629-3478. Elizabeth Hans McCrone has a professional background in media and communications, specializing in radio and television. 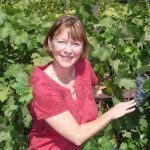 In addition to pursuing all things wine-related, she teaches journalism classes at Humboldt State University and works at Francis Ford Coppola Winery in Sonoma County, CA. Great to see one of Humboldt County’s wineries featured, particularly Winnett’s with its commitment to the whole process and organic cultivation. Winnett wines make lovely pairings with Humboldt County’s other locally produced foods available at local markets and seasonally at our traditional farmer’s markets. Great Article! California has such a huge number of fantastic places for (wine) grape-growing, it is a pity we’re always stuck to the same spots. I wish you don’t mind me sharing the tables below with climate, best grape varieties and heat summation statistics for the two Willow Creek AVA areas mentioned above. Landed in Humboldt County in early seventies… never left. Nice to see others making a new niche here behind the “redwood curtain”. After generations of slash and burn attitudes associated with lumber and fishing resources, we welcome good stewards of this special place. Good reporting by Ms Hans-McCrone!